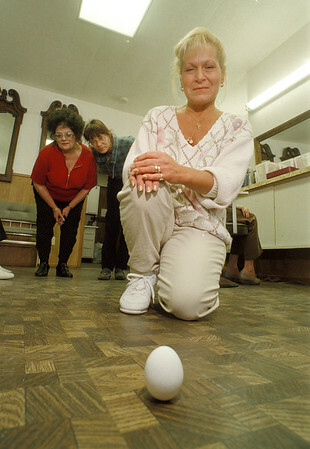 3/20/97 Vernal Equinox Egg - James Neiss Photo - Hairdressers stand egg on end on Vernal Equinox - Pat Shira Forground shows off the egg she stood on end at 8:55 am which stood for nearly 3 hours to customers delight. Behind are Owner Donna Earp and Bary Ann Pasqualichio. All Hairdressers at Salon Donna Marie on Pine Ave.